Arrive in Levanto. Originally a Roman town, it now has medieval walls, a 13th century castle and elegant Neo-Classical buildings from its days of grandeur as a fashionable bathing resort in the 19th century. Free day in Levanto: Optional circular walk in the hills, once the domain of the feared Zolaschi, who controlled the ancient ridge-top trade route (6.4 or 8 miles, 3.5 or 5 hours). Additional walk to the coastal village of Bonassola (1 hour), returning by train or on foot. Levanto to Monterosso: Superb coastal path, through pine woods and scented scrub, with views of the whole Cinque Terre. A stepped path leads down to Monterosso, with medieval centre, castle and Cappucin convent (4.8 or 9.7 miles, 2/5 or 6 hours). Free day in the area: A steady climb up a cobbled path brings you to a ridge with wonderful views - both inland and seaward, leading to the sanctuary of Madonna di Reggio, from where a fine pilgrim path leads gently down to Vernazza, the former Roman port of 'Vulnetia' (7.9 miles/5.5 hours). Return along the coast by train, boat or on foot. Monterosso to Riomaggiore: Walk, following paths along the coast, with views of the famously picturesque villages of the Cinque Terre, and their terraced vineyards. There is a range of routes to choose from (up to 14.3 miles/8 hours). NB: Some coastal sections of this day's options may be crowded or closed, particularly in high season, but there are delightful alternatives. Riomaggiore to Portovenere: Up through terraced vineyards to the wooded ridge, via the sanctuary church of Montenero, then through pine, chestnut woods and scrub, before emerging to views of the dramatic coastline and descending to Portovenere (8.7 miles/5.5 hours). Free day in Portovenere: Explore Portovenere or take a boat to the island of Palmaria, with picturesque paths and beaches for swimming (3 miles, 2.5 hours). Departure day. NOTE: Paths in the national park may, on occasion, be temporarily closed due to adverse weather or other considerations. The ATG Route Book provides for this eventuality by including a range of equally beautiful route options for each day. Your Route Manager will advise you accordingly. The five villages of the Cinque Terre are connected by frequent local trains. This provides a daily choice of walking options, from easy to challenging (Grades 2, 3, 4), with over 100 miles of excellent paths. The coastal path follows the contours of the coast and is punctuated by flights of ancient steps. Once you are on the ridge (2,000 ft) you can walk on fairly level terrain. The paths are mostly ancient but well-preserved, though steep, narrow and rough in places. Short sections of route not suitable for vertigo sufferers – alternative paths are available. NOTE: Paths in the national park may, on occasion, be temporarily closed due to adverse weather or other considerations. The ATG Route Book provides for this eventuality by including a range of equally beautiful route options for each day. Your Route Manager will advise you accordingly. Excellent fresh seafood including very local specialities, including the ‘bati-bati’, a species of curious, but very flavoursome local crayfish, and mussels from the Gulf of La Spezia. Local produce from small farms in hills along the coast. Good trattorie everywhere on route, and a couple of very good restaurants. Cinque Terre wines have been renowned from antiquity. Some good DOC wines, especially from Levanto, and Sciacchetra (dessert wine). All good. Very manageable distances. Varied terrain, flora and fauna. Amazing views! Lovely trip, beautiful part of the world. Is there a frequent morning ferry service back from Portovenere to Levanto for onward journey to Pisa? On the daily itinerary there is a range of distances and times stated. What is the basis for the differences? Hello, thank you for your message. The walking distances on this route are varied. There are both low (easy), coastal route options and high (more challenging) routes on each day. In addition, as there is a train that runs along the coast it is very easy to shorten routes by taking a train for part of the day’s walk. I hope this answers your question. This route accommodates very diverse walking preferences and fitness levels. Hello, the closest airports are Genoa and Pisa. A train from Genoa train station takes approximately 1.5 hours to Levanto, from Pisa 2 hours. Hello, thank you for your enquiry. The single supplement is £136. This route includes breakfast but not lunch and dinner. Places to purchase picnic lunch and restaurant suggestions are included in the route book. Your Route Manager can also help you with this. in comparison to the rest of Northern Italy and also comparatively wet. 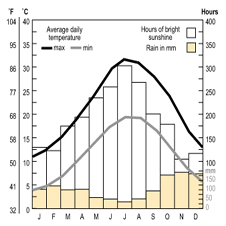 From mid-May to June and in September the weather is most settled but can also be quite hot. Summer is very hot but there are cooling breezes from the sea and there is shade when walking along the ridge and intermittently on the lower paths; from early summer to autumn swimming in the sea is possible in each of the villages we visit. This trip encompasses Grades 2, 3, and 4 which reflects the extremely wide range of walking options. may be rough and narrow in places. This is a relatively demanding walking route but as distances are not that great the pace is relaxed. The Route Manager will be able to advise on shorter/easier routes to take. The paths are good coastal trails, which can be very narrow in places. It is generally rocky. The tracks up onto the mountain ridge are partly paved mule tracks. The ridge track itself is often good and fairly level. NOTE: Paths in the national park may, on occasion, be temporarily closed due to adverse weather or other considerations. The ATG Route Book provides for this eventuality by including a range of equally beautiful route options for each day. Your Route Manager will advise you accordingly. longer walks, often in woodland. Lower routes & scenic paths: In between the ridge and the coast. Easier and often panoramic. Coastal paths: Mostly up and down on ancient stony steps that are narrow/steep. Many of the coastal and higher valley walks follow the edges of terraced vineyards with drops of just a few metres. There are also some short sections of coastal path with sweeping sea views, which may feel exposed to those who do not feel sure footed or suffer severely from fear of heights (notably on the last section of the route, to Portovenere). Between Levanto and Riomaggiore there is a train line just inland from the coastal path which stops at all the villages en route so if you decide at any stage you don’t want to carry on with the walk you can always get one of the regular trains to the next village (there is also a frequent boat service connecting the five villages). Generally the route is not problematic for most because of the vegetation. An alternative route with a bus link is provided on the final stage for severe sufferers of vertigo. The circular route around Vernazza via the ridge has a steep ascent and descent. 8-day: Walks are offered on 6 days. 5-day: Walks are offered on 3 days. The walk lengths vary from 2.5 to 7 hours maximum. Hours of walking, which may vary from individual to individual, means hours of actual walking and does not include stops for lunch, sightseeing, rests or siestas. The walk takes you on stepped and rocky coastal paths – please make sure that your footwear provides sufficient ankle support. Walking Pass: you will need to purchase a walking pass locally to walk the path between Monterosso and Riomaggiore. This can be a simple pathways ticket, which will also give you access to the park buses and services at €5 per person, per day, or a combined park and train ticket at €7.50. Your Route Manager will be able to discuss the options in more detail with you at your briefing. The recommended destination airports for this route are Genoa or Pisa. From Pisa airport:'PisaMover', a high-speed, fully-automated rail link takes you from Pisa Airport to Pisa Centrale train station in the centre of Pisa in less than 8 minutes and departs every 5 to 8 minutes between 6.00 am and midnight 365 days a year. Cost: € 2.70 per person one way. Tickets can be bought at the biglietteria (blue ticket machine) at the airport station. The bus takes 8 minutes, costs €1.30 and departs every 10 minutes from outside the terminal. You should be able to buy a combined PisaMover and train ticket to avoid queuing for a train ticket at Pisa Centrale. Alternatively you can take a bus or taxi to Pisa Centrale. The bus stop is outside the airport; tickets are purchased from the Tourist Information counter opposite the check-in desks (or machines) inside the airport. You need to catch bus no. 3 which takes approx 5 mins to the main station and costs about €1. There are very few buses on a Sunday, but taxis can be called (or there may even be some waiting outside). Journeys take only a few mins and cost about €6. From Pisa Centrale, there are regular train links to Levanto via La Spezia. You may have to change trains at La Spezia, though some trains are direct. Journey time 1.5-2 hrs, cost €8-€18 depending on type of train. NB: Please remember to validate your ticket by stamping it in the green and white or yellow machines at the start of the platform before you board the train; you can be fined if you have not done so. From Genoa airport: you will need to take a train, bus or taxi to Genova Piazza Principe, the main train station. Buses and taxis leave from outside the airport. There is a shuttle bus, called the ‘Volabus’ (bus number 100) which departs the airport every 30-60 minutes (depending on time of day) and takes 12-20 mins (depending on traffic; longer in rush hour) to reach Genova Piazza Principe. It also continues to Genova Brignole station. The ticket, which can be bought on board, costs €6. (For those spending time in Genova before continuing their onward journey, this fee covers a further hour’s travel on the city public transport network.) For the Volabus timetable go to www.airport.genova.it and click on ‘Transports’, then ‘Public Transports’! Taxis to the station take 15 mins (up to 30-40 mins at rush hour) and cost approx €22 (more if there is a lot of traffic and progress is delayed). A local train (regionale) leaves from Sestri Ponente station and reaches Genova Piazza Principe in approx 12 mins. From the airport, walk out of the airport area, look for a bridge, cross it and follow steps on the other side to the station (a few minutes’ walk). Trains from Genova Piazza Principe to Levanto leave fairly regularly (a journey of approx 1 hr 20 mins, cost €6-9) although there are trains that are both faster and slower than this. We can book you a taxi to the first hotel. The taxi holds 3-4 passengers (depending on luggage) and costs approx €180 from Pisa airport (journey time is 1.5-2 hrs). From Genoa airport a taxi will cost approx €180 (journey time is 1.5 hrs). Prices may vary at weekends, Bank Holidays or late at night. You may find that if you have heavy bags it would be better to take a taxi from the station to the first hotel as it is a 10-15 min walk. The taxi will cost approx €10. If it is difficult to find a taxi outside the station, you could phone the hotel and ask them to summon one. To Hotel Nazionale: from the station walk straight across car park and down steps to road. Turn R. After 75m follow the road curving left across bridge. At the junction on far side of bridge keep straight on along tree-lined avenue (e.g. do not turn L). Continue past school playground LHS. Turn L into Via Jacopo da Levanto (poorly signed but palm trees are visible at far end, LHS, even from here). Hotel Nazionale is on Via Jacopo, about 300 metres on, just past the palm trees. To Villa Margherita (approx. 850m): from the station walk straight across car park and down steps to road. Turn R. After 75m follow the road curving left across bridge. At the junction on far side of bridge keep straight on along tree-lined avenue "Corso Roma" (i.e. do not turn L). After 300m at crossroads (Hotel Palace on corner RHS), turn R and go up the steps at the end, over the bridge and continue straight ahead to another set of steps at the end of the road. Once at the top, cross over to the other side and turn R (beware of traffic – narrow road). Bottom entrance to Villa Margherita is on the LHS after 100m. advance. In addition to this, there are public car parking spaces around Levanto and along the sea front and train station. You can get back to Levanto from Portovenere: by boat (depending on the time of year), by bus to La Spezia and then train to Levanto, or by taxi. Please ask your Route Manager for details when you arrive. will find that fish and seafood dishes dominate the menus (sometimes to the exclusion altogether of meat dishes), either grilled or oven-baked or made into delicious sauces for pasta. Sea bass (branzino), bream (orata) and cuttlefish/squid (seppie/calamari) are favourite catches, often served alla brace (grilled over the coals). Pesto, synonymous with Liguria, is a very good example of how everything that is available is used – basil, pine nuts, olive oil and garlic – all of which are grown on the carefully sculpted terraces carved into the hillside. There are a variety of other vegetarian specialities in this region, including mesciua (chickpea and barley soup), torta di verdura (vegetable and filo pastry tart), testaroli (thick, griddled baked pancakes, chopped and tossed into boiling water; served like pasta with pesto or walnut sauce) and salsa di noce (walnut sauce for pasta dishes). Local pastas include trofie (chewy pasta twists) and pansotti (like ravioli, filled with ricotta and spinach). You can try a selection of the local wines, notably the whites from the grapes cultivated in the famous DOC Cinque Terre vineyards and the local dessert wine Sciachettrà. They all have WIFI and hair dryers. All have laundry service except for the Nazionale. The recommended airports for this trip are Genoa or Pisa. 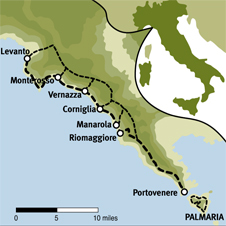 From Genoa and Pisa there are trains to Levanto (1.5–2 hours). Cost: from Pisa ~€8 - €18; from Genoa ~€6 - €9. A taxi from either airport costs €180. Prices may be significantly higher on Sundays and public holidays. Taxis can be booked via the ATG office. For more detailed information on reaching the route, see Frequently Asked Questions.